Copyright Washington Post; reprinted by permission of the DC Public Library. Ruth Pratt, a New York City icon of government reform and fiscal conservatism, won election to the House of Representatives on the eve of the worst economic disaster ever to befall the country. Congresswoman Pratt’s support for the Herbert Hoover administration’s cautious programs to remedy the Great Depression held firm, even as the national crisis worsened and Americans, in ever–greater numbers, looked to the federal government for relief. Ruth Sears Baker was born on August 24, 1877, in Ware, Massachusetts, daughter of the cotton manufacturer Edwin H. Baker and Carrie V. Baker. Ruth Baker attended Dana Hall in Wellesley, Massachusetts, and Wellesley College, where she majored in mathematics. She also studied violin at the Conservatory of Liege in Belgium.1 In 1904, Ruth Baker married John Teele Pratt, a lawyer and the son of Charles Pratt, a pioneer Standard Oil Company executive and founder of the Pratt Institute in Brooklyn. The couple settled in New York City’s Upper East Side and raised five children: Virginia, Sally, Phyllis, Edwin, and John, Jr. Ruth established strong ties with the community by engaging in a range of philanthropic activities. When her husband died in 1927, he left Ruth Pratt a fortune estimated at more than $9 million. Pratt’s involvement in Republican politics in New York began during World War I, when she worked with the Woman’s Liberty Loan Committee. She served on the mayor’s wartime food commission and met Herbert Hoover, then head of the National Food Administration.2 She remained a Hoover devotee throughout her political life, working for his presidential nomination in 1920 and helping to deliver the New York state delegation to Hoover’s side at the 1928 GOP convention.3 Pratt initially balked at the notion of elective office, choosing instead to focus on the upbringing of her five children. In January 1924, she was chosen as the associate GOP leader of New York’s Upper East Side Assembly district—providing her a powerful political base for the next decade. When she overcame her reluctance to enter the political limelight and campaigned for city alderman against Democrat James O’Gorman, the race received national attention because no woman in New York City history had ever served on the city’s governing body. With a heavily Republican constituency, Pratt won by a wide majority on November 4, 1925.4 As alderman, she clashed repeatedly with Tammany Hall, the Democratic political machine, particularly over the budget, which she believed could be slashed by millions if spending, patronage positions, and rampant graft were curtailed. She became known as the “Watchdog of the Treasury.”5 In 1928, after winning re–election by an even larger margin, she introduced measures to authorize construction of the Triborough Bridge and tunnels under the East River. Pratt entered the race for an open U.S. House seat in September 1928, when Democratic incumbent William Cohen declined the nomination. Her combination of wealth, social standing, and knowledge of local politics suited New York’s “Silk Stocking District,” an area that cut a geographical East–West swath across midtown Manhattan and included the city’s wealthy parts of the theater district, and the westside docks and shipping businesses. Running on a platform that called for modifying the Volstead Act and the 18th Amendment (Prohibition) to allow for the production of light wines and beer but no hard alcohol, Pratt comfortably won the September 28 primary with 62 percent of the vote.6 In the general election, she emphasized her credentials as an alderman against Democratic opponent Phillip Berolzheimer, who ran as a “wet” anti–Prohibition candidate.7 She defeated Berolzheimer with 50 to 44 percent of the vote—despite the fact that the Democrats had a strong ticket, featuring New York Governor Al Smith as the party’s presidential candidate. “That puts the Seventeenth District, back where it belonged, in the Republican column and I am glad that a woman did it,” Pratt rejoiced on election night. “But I did not run as a woman. I ran for the Board of Aldermen and for Congress not as a woman but as a citizen.”8 When she took her seat in the 71st Congress (1929–1931), Ruth Baker Sears Pratt became the first woman to represent New York in the national legislature. During Pratt’s first term, she received assignments on the Banking and Currency Committee, the first for a woman and a nod to her work on New York City’s budget and the Library Committee. In her first House speech, she criticized a proviso of the Smoot–Hawley Tariff Bill that raised the duty on sugar imports, arguing that the increase would be needlessly passed on to consumers and would fail to improve the wages and conditions of sugar workers.9 Pratt’s first House bill sought to increase benefits for permanently disabled World War I veterans, though she would later oppose an across–the–board bonus for all veterans.10 She also favored repealing the 18th Amendment and, after the onset of the Depression in 1929, noted that liquor production, transportation, and sales would create new jobs.11 In January 1930, from her seat on the Library Committee, Pratt introduced a bill for a $75,000 annual appropriation to acquire and publish books for the blind. With the public backing of Helen Keller, a nationally recognized advocate for the blind, it eventually passed the House and Senate, providing the Library of Congress $100,000 annually to procure Braille books. Pratt also presided over the House as Speaker pro tempore on numerous occasions during her first term. Internal politics within her district threatened to derail Pratt’s 1930 re–election bid. Able to secure the Republican nomination despite dissension in the party ranks, Pratt faced Tammany Hall’s handpicked Democratic candidate, City Magistrate Louis B. Brodsky, in the general election and the journalist Heywood Broun running on the Socialist ticket.17 Though she polled only about half the total of her first election, Pratt held on to win by a bare margin—695 votes out of some 45,000 cast. In 1932 she faced yet another tough battle to win re–election to the House. Prior to the 1932 GOP National Convention, a faction in the New York delegation, disenchanted with Hoover, attempted to unseat Pratt as a delegate. The move failed but seemed to weaken her base of support heading into the fall elections.18 In the Republican primary, she weathered charges from opponents that she had abused the House franking privilege. After securing the Republican nomination, Pratt squared off against Democratic challenger Theodore A. Peyser.19 With the two candidates agreeing on the substantive issues, the decisive factor in the race became the presidential election. Disenchanted with Hoover’s economic policies, American voters swept New York Governor Franklin Delano Roosevelt and his Democratic coalition into the federal government. In what had been an evenly divided House, the Democrats gained a commanding majority as the GOP hemorrhaged—losing 111 seats. In her Manhattan district race, Pratt lost to Peyser in a four–way race by a margin of 53 percent to 44 percent. 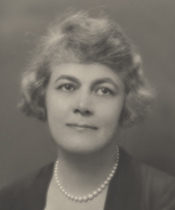 After Congress, Ruth Pratt served as chair of the Fine Arts Foundation, a forerunner of the National Endowment for the Humanities, and was appointed to the Republican Builders, a group formed to renew the party after the defeats of 1932 and 1934. She continued to live in New York City and was president of the Women’s National Republican Club from 1943 to 1946. On August 23, 1965, a day before her 88th birthday, Pratt died in Glen Cove, New York. 1“Then Along Came Ruth–To Congress,” 14 April 1929, Washington Post: SM3. 3Ruth Baker Pratt: A Sketch of Her Activities (n.p., 1930) in Library of Congress as a pamphlet: E748. P87R8. 4“Woman Alderman Surveys Victory,” 8 November 1925, New York Times: XX6. 6“Mrs. Pratt for Wine and Beer by Change in Volstead Law,” 9 August 1928, New York Times: 1; “Endorse Mrs. Pratt for Congress Seat,” 20 July 1929, New York Times: 5; “Mrs. Pratt To Begin Campaign Next Week,” 28 July 1928, New York Times: 2. 7“Mrs. Pratt Debates Issues,” 16 October 1928, New York Times: 20. 8“Mrs. Pratt Victor in Congress Fight,” 7 November 1928, New York Times: 20. 9Congressional Record, House, 71st Cong., special sess. (20 May 1929): 1546–1547. 10Ruth Baker Pratt: A Sketch of Her Public Activities: 13. 11“Ruth Pratt in Fight for Repeal Bars Saloon; Would Sponsor Bill to Modify the Volstead Act,” 18 October 1932, New York Times: 10. 12Congressional Record, House, 71st Cong., special sess. (6 May 1929): 912. 13Congressional Record, House, 72nd Cong., 1st sess. (7 June 1932): 12207. 14Congressional Record, House, 72nd Cong., 1st sess. (27 May 1932): 11460–11462. 15Mildred Adams, “Congresswomen Are Just Congressmen,” 19 June 1932, New York Times: SM7. 16Jean Eliot, “Many Favor Mrs. Pratt in Mayor’s Race,” 2 August 1929, Washington Post: 7; “Ruth Pratt Favored for Seat in Senate,” 17 February 1931, Washington Post: 3. 17Jean Eliot, “G.O.P. Split May Defeat Mrs. Pratt,” 24 June 1930, Washington Post: 8. 18W.A. Warn, “Fight on Mrs. Pratt Is Growing Sharper,” 14 June 1932, New York Times: 1. 19“Women Form Group to Work for Peyser,” 16 October 1932, New York Times: 31. "Ruth Sears Baker Pratt" in Women in Congress, 1917-2006. Prepared under the direction of the Committee on House Administration by the Office of History & Preservation, U.S. House of Representatives. Washington: Government Printing Office, 2006.